Amazon‘s Alexa voice platform allows customers to shop on Amazon with voice commands rather than browsing and selecting. Amazon has been making it easier to shop using voice with Alexa, but the company’s focus now seems to increasingly be turning to using the voice assistant as a platform to trial digital subscriptions like music and video streaming. In its most recent earnings call, Amazon executives hinted that the company would focus more on selling services, like Amazon’s unlimited music-streaming service, to go along with its Alexa devices. Amazon’s Alexa voice assistant is maturing, and so is its path to monetisation. In Amazon’s quarterly earnings call on July 26, the company’s head of investor relations, Dave Fildes, said that people were “enjoying” the company’s Alexa-powered devices, but didn’t directly address its role as a voice-shopping service. “I think we’re having a lot of success with devices and customers are enjoying those,” Fildes said in response to an analyst’s question about the impact that Alexa is having on Amazon’s retail business. Taking that in a vacuum, you might think that the voice-shopping future that Amazon heralded with Alexa’s debut has not yet arrived. However, Amazon has yet to throw down its ace in the hole: digital services made better by Alexa. Amazon’s services – like audiobooks, grocery, and music streaming – have stayed in the 50% growth range since at least the first quarter of 2017. Amazon has experienced success with its Amazon Music Unlimited service, noting that it has tens of millions of paid customers. Fildes said on the earnings call that “it continues to grow very quickly,” and that Prime members with an Alexa device tend to first use the more limited, but already-included, Prime Music service before graduating to the $US8-a-month and more feature-rich Unlimited one. Since they can get users in the habit of cuing up music with voice commands, Alexa-enabled devices like the Echo speakers have the potential to convince those who don’t already have premium digital music subscriptions to buy them. At $US7.99 a month for Prime members, Amazon Music Unlimited is cheaper than the $US9.99 a month Spotify and Apple Music charge for their digital music services. Amazon also offers device-only subscriptions for Unlimited for $US3.99 a month. 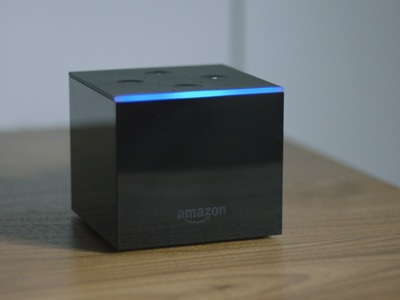 AmazonThe Amazon Fire TV Cube. But Amazon has been shifting away from audio-only devices, making Echo devices with screens and debuting the Amazon Fire TV Cube, an Alexa-powered entertainment and home technology hub. The Fire TV Cube marries the listening abilities of an Echo with the TV-controlling power of a Fire TV. The Alexa-enabled Fire TV Stick was a top-selling item on Prime Day, when it was at its cheapest-ever price of $US20, or 50% off its usual price. Fildes said that Amazon is “really pleased” with the growth it’s seeing from the company’s channel offerings, which provide a way to buy discrete memberships to premium digital channels like HBO, Starz, and Showtime. “We’ve seen some good channels come online over the last few quarters, and seen some good traction there. So we’ll keep focusing on building out even better selection, because it’s clear to us that customers want that option to be able to add that content as part of their Prime memberships,” he said.